Two of my many eclectic interests dovetailed nicely this week; the High Holiday festival of Sukkot of which much has been written* and the art of juggling; specifically as practiced in the ancient but less familiar custom of Simchat Beit HaShoeva (Water Drawing Celebration). Sukkot began in the mostly agrarian society of ancient Israel as a seasonal harvest celebration when a portion of fresh produce was offered as tribute to the Temple in Jerusalem. After the destruction of the first and second Temples, this holiday became characterized by a ‘sukkah’ or three-walled temporary ‘house’ and a ‘bouquet’ representing the four species associated with the holiday as mentioned in the Torah. ** These ‘arba’a minim’ are: an etrog or citron fruit, one sprig each of myrtle and willow and a palm frond or ‘lulav’. These are held together and blessed in a special way upon entering the sukkah’. In addition to offering prayers, meals are shared with family and friends during the eight days of the holiday. 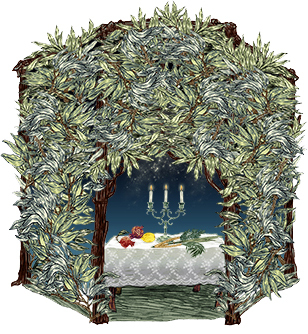 In time, the Sukkot holiday acquired deeper significance as a beautiful spiritual recognition of life’s finite nature and of the importance of living joyfully despite hardships both natural and man-made. And here is where my interest in juggling, particularly as it relates to Jewish history, comes in. Though I do not have the requisite skills, I’d become interested in the art of juggling and its colorful traditions many years ago when one of my sons demonstrated a special talent for it and turned professional at age nine, maintaining his career and associated travels until beginning college. 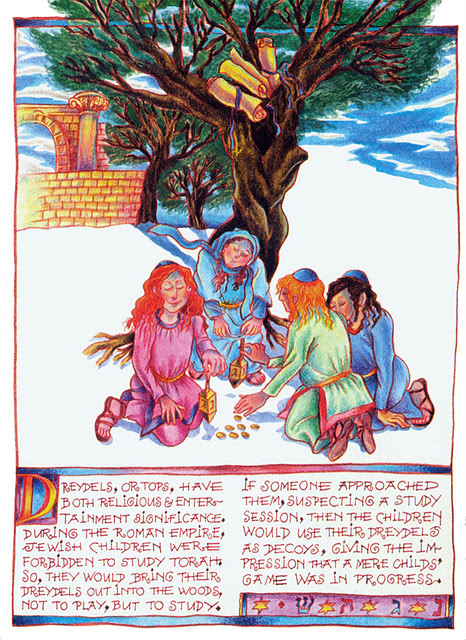 But I first learned about jugglers in Jewish history upon reading a fascinating article by Raphael Harris in a 1995 edition of Juggler’s World***, one of the magazines my son received as a member of the International Jugglers Association. In it, Mr. Harris, who was a professional juggler in Israel at the time, describes the ancient custom of Simchat Beit HaShoeva which occurs during the Sukkot holiday when waters are drawn from a spring near Jerusalem for use in the Temple service. It seems that juggling at joyous occasions was inspired by the prophet Isaiah (“with joy shall you draw water out of the wells of salvation.” –12:3) and practiced by several distinguished sages and scholars such as Shmuel bar Abba (180-275 CE), Levi bar Sissa (150-220 CE), Abaye (280-339 CE) and Rabbi Shimon Ben Gamliel (10BCE-70CE), the titular head of the Sanhedrin or High Court who was the earlier juggler mentioned. Rabbi Ben Gamliel was known for his ability to juggle eight lighted torches. He would toss them in the air in a pattern to ensure that they never touched each other. In addition, he would then prostrate himself on the ground, raise himself into a headstand and manage to kiss the ground before standing up again, an unheard of feat until then. 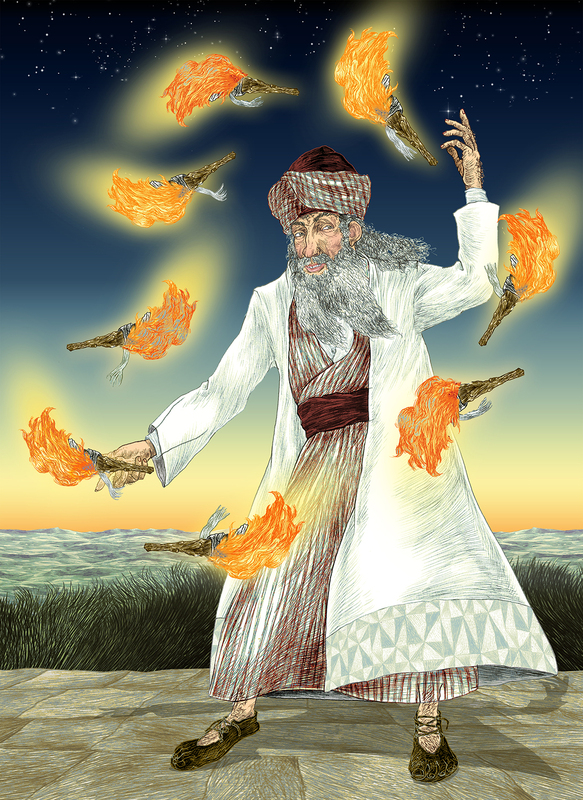 Juggling eight of anything, let alone flaming torches is a masterful feat but I became curious as to the significance of that number and eventually came upon a 2002 article by Calgary Rabbi Eliezer Segal. 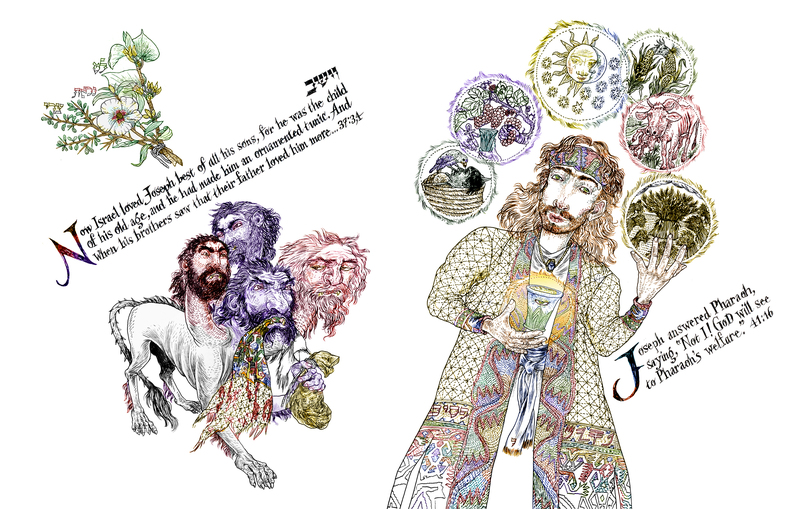 All of this led me to portray Rabbi Shimon Ben Gamliel and his eight torches for the illustration above as part of a new series of drawings in tribute to the art of juggling that I’ve been developing during the past few months. In addition to the ‘The Art of Juggling Dangerously’ (published here on August 10th, 2015) which also addresses fire torch juggling but from a different perspective, I’ll post some of the others here at Imaginarius as they are completed. Meanwhile, I wish all who observe and/or appreciate the Sukkot holiday much joy in its remaining few days ahead ! But the opportunity for in-depth research into this subject did not assert itself until 2013 when I began An Illumination Of Blessings, this Kickstarter project. Even though my personal background to date did not include the religious or social impetus to actually visit a mikveh, I learned that the ritual of immersion (tevillah) is one of three essential (mitzvot) commandments reserved for women* and decided to include it in this collection. In brief, the mikveh, which literally means a collection of water in Hebrew, is more than a pool of water. According to Tractate Mikva’ot in the Mishnah (the 2nd century CE codification of the Oral Torah), it must be a bath designed with specific dimensions and capacity to hold water that is stationary but which originates from a flowing natural source (a lake, ocean or rainwater) to permit ritual and spiritual purification. At the links below, there are a number of articles detailing the history of the mikveh and the legal (halakhic) requirements for its use. Today, despite the long and often painful history of Judaism, immersion in a mikveh remains a viable practice among observant Jewish men and women. Many modern mikvaot, while adhering to those classic dimensions, also exhibit an awareness of the necessity for religious and spiritual continuity. These have been designed to resemble stylish, well-appointed spas such as the Mayyim Hayyim mikveh in Newton, MA. 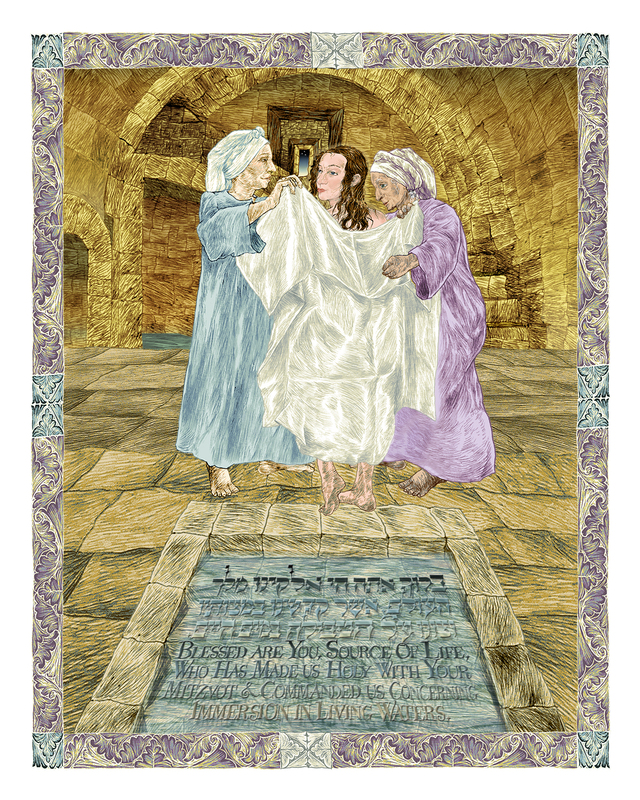 The setting of my illustration, an early 20th century mikveh in Israel whose water can be seen flowing into it from the passageway beneath the stairs, was inspired by a beautifully made 1997 film called “Women” directed by Michal Bat Adam and Moshe Mizrahi. Here I have shown a young woman with two attendants who are required to observe her immersion and ensure that it is done properly. Three stars, seen through the tiny window in the background signal the onset of the Sabbath, a traditional time for this ritual. Usually a sign displaying the immersion blessings is posted near the pool but with a bit of artistic license, I incorporated the words into the water itself suggesting that like water, our history has been mercurial, yet the consequences and benefits of using it mindfully are eternal. *in addition to lighting the Sabbath candles and separating the challah. Today “challah” refers to the bread eaten on Shabbat and holidays. Originally “challah” referred to the small piece of dough that was set aside for the kohen (priest) when making bread (Numbers 15:20). Today Jewish women bless, separate and burn a small piece of dough when making bread in remembrance of the portion given to God (through the Temple priests) in ancient times. This ritual reminds us that sustenance ultimately comes from God and transforms baking bread into a spiritual act. That Was Delicious, May I Have My Check, Please? Outside of those whose regular practice is to recite the blessings after each meal, I suspect that, per the title of this post, more expressions of gratitude for our food go to our servers in restaurants upon receipt of our tab and/or to the chef for a meal well-prepared and thoughtfully presented rather than to the more ethereal Source of Life. Though I have not always done so, in recent years I’ve decided to try and experience my meals as more than just stuffing my face; whether it is to appreciate the combinations of colors and textures, the unique fragrances of each item on the plate or just acknowledging the complex processes that have made this meal come together as a gift of nourishment for body and soul. This line of thinking and the memories of fine meals past and present led me to choose the Birkat Ha-Mazon or the Blessings After Meals for my next illumination. Research began with wondering about the origin of this set of blessings and pointed to the reference I found in Devarim or Deuteronomy 8:10: “When you have eaten and are satisfied, you shall bless the LORD your God for the good land which He gave you”. I learned that the lengthy combinations of blessings and songs of thanks consist of four distinct but related ideas expressed in a lovely poetic stanzas. They are: the Birkat Hazan (blessing for nourishment and praise for the One Who Sustains the World), the Birkat Ha’aretz (blessing for the Land of Israel), the Binyan Yerushalayim (blessing for the rebuilding of Jerusalem), and the HaTov V’Hameytiv (blessing for the One Who Is Good and the One Who Does Good). Following these blessings, a group of short prayers beginning with the word HaRachaman (The Merciful One) ask the Source of Life for compassion. Although several versions of the Birkat Ha-Mazon can be found within Judaism (Ashkenazic, Sephardic and Yemenite), I’ve chosen the Ashkenazic form with which I am most familiar. Accordingly, the illustration includes medieval Jews of Central and Eastern European ethnicity, my own cultural background. The pewter dinnerware on the table are empty indicating the conclusion of a meal. Since the figures portrayed are not nobility, their durable pewter might have been more commonly used than finer metals or porcelain. 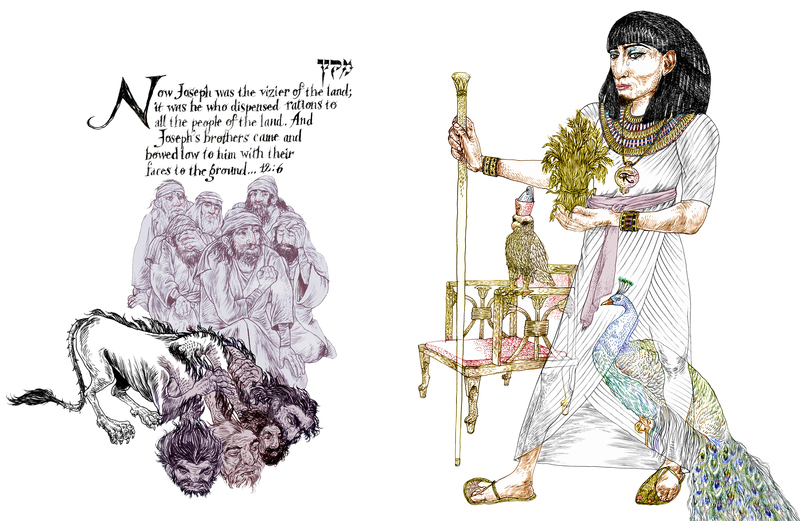 Above this group are four items reflecting the concepts of the blessing’s four verses; a winged crown, a jar of biblical manna, a lion and a model of Jerusalem surmounted by a living date palm. Each item has it’s mundane and mystical purpose and detailed explanations of these will appear in the artist’s commentary of An Illumination Of Blessings. So I guess the question I have via this blessing is; do you live to eat or do you eat to live? If your choice is the latter, then maybe a little mindfulness will help us realize how to make everything we eat that much tastier… or as the French Ashkenazim might say, ‘Be’ te-avon’ (Bon Appetit)! The Mi Shebeirach is recited for those in need of healing, whether spiritual, physical or both. The first recorded appearance of this blessing/prayer was in the 12th century French prayerbook, The Vitry Mahzor compiled by the Talmudist Simcha ben Samuel of Vitry. It’s original intention was to petition for the well-being of the community and indeed its essence is preserved in the Amidah, as one of the set of prayers recited three times daily. But in recent times, in Reform and Conservative practices it is recited after the Torah reading and includes names (usually their Hebrew names) of specific individuals in need of healing by those praying on their behalf. 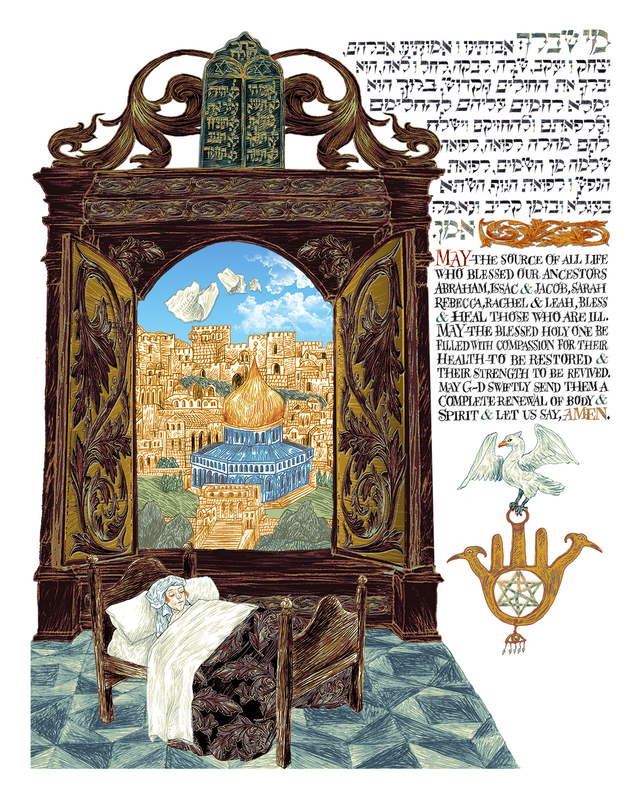 As I thought about the significance of this blessing/prayer and why it has changed over time, I realized that the Mi Shebeirach also tells us that we must partner with the G-d Who is The Source of Life by participating in our own recovery or in that of a loved one(s) to the best of our ability, whether it be through seeking medical intervention or by recognition of an ailing spirit that can manifest as physical illness. Forgiveness of oneself and/or others is one of the elements at the core of this process. Although the future outcome of serious illness is often unclear and sometimes all we can ask for is strength to endure, I feel this blessing speaks for all of us living and working together as community to understand the bigger picture of life and our role in it. For those of you and those within your extended circle in need of healing, I wish you a full and speedy recovery of body and spirit. 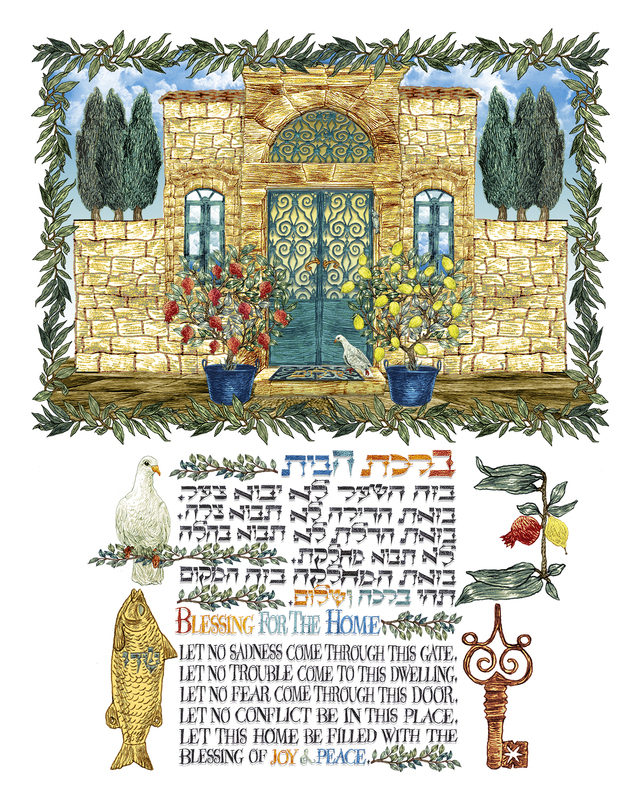 We are pleased to welcome guest blogger Ilene Winn-Lederer, artist, illustrator, and author of Between Heaven and Earth: An Illuminated Torah Commentary. In today’s post she provides a brief history of Hanukkah and explains the symbolism of the menorah. Hanukkah begins this year at sunset on December 20. The holiday of Hanukkah, or the Festival of Lights, commemorates the historical events that showed the Jewish people’s resilience during the enforced prohibition of their faith and religious culture. In the writings of the Jewish historian Flavius Josephus, the story begins in 175 BC, when Judea, then part of the Syrian Seleucid Empire under the benevolent rule of King Antiochus III, was invaded by the armies of his son, Antiochus IV Epiphanes, goaded by special interests dedicated to imposing Greek culture on the Jews. 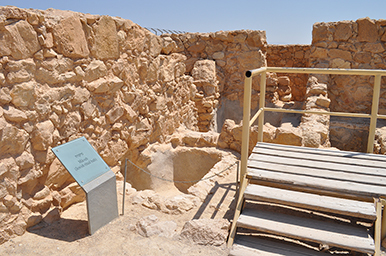 After the invasion that resulted in the looting and desecration of the Second Temple at Jerusalem, all practices associated with Judaism were outlawed. In 167 BC, when Antiochus IV installed an altar to the Greek god Zeus in the Temple, he provoked the bloody Maccabean revolt for Jewish independence. The leaders of this rebellion were Mattityahu, a Jewish priest, and his five sons Jochanan, Simeon, Eleazar, Jonathan, and Judah, who later became known as Judah the Hammer (Judah Maccabee). After the death of his father in 166 BC, Judah inherited the mantle of leadership and under his watch, in 165 BC, the Jewish revolt against the Seleucid monarchy was completed. The Temple was then rededicated with a new altar, a restored menorah (candelabrum), and new holy vessels required for proper religious observance. According to Jewish law, the lights of the menorah must be tended for continuous illumination. The Talmud (a core text of Judaism) explains that after the Temple was desecrated, only enough pure (undesecrated) olive oil remained to keep the menorah’s eternal flame burning for one day. 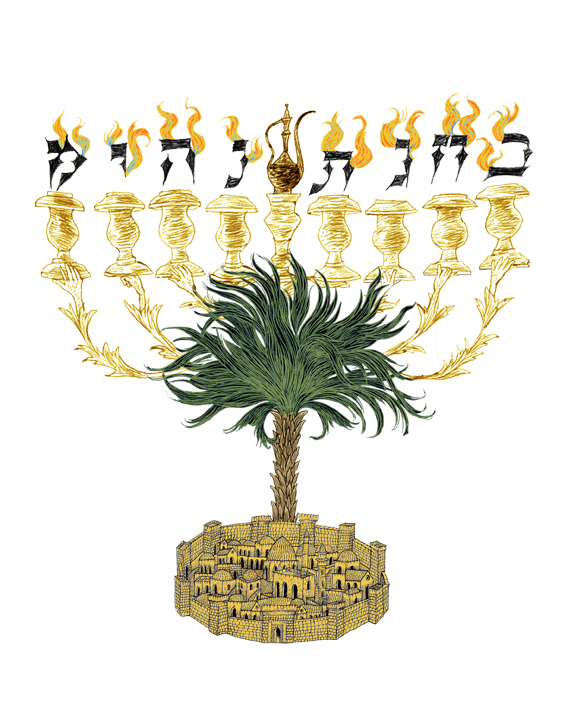 The Talmud also states (in Menachot 28b) that the Jerusalem menorah, which has seven branches, may not be used outside the Temple. So the menorahs used for Hanukkah observance are called hanukiya. They have eight branches plus a ninth (called the shamash or servant), set off from the others, that is used for lighting them. 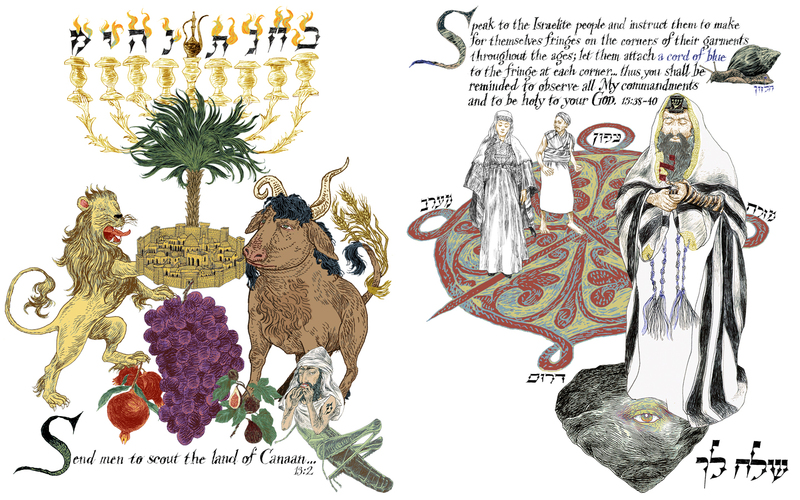 In Between Heaven and Earth, Ilene Winn-Lederer illustrates the Torah reading preceding Hanukkah, Parashah VaYeishev from the Book of Genesis. 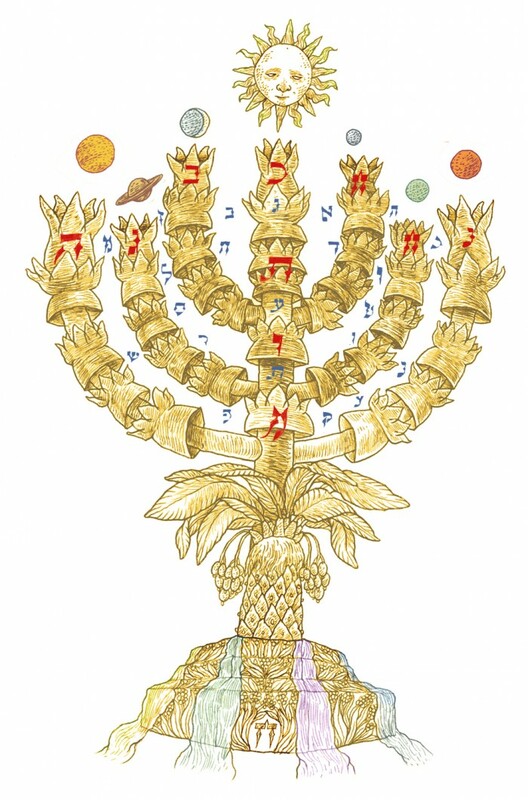 Her commentary in the AfterImages portion of the book about this illustration provides further insight into the structure of the menorah and its symbolism. The steadfast spirit of Hanukkah is also reflected in the preceding weekly Torah portion, Parashah VaYeishev, found in the Book of Genesis. It recounts the story of Joseph and his brothers, sons of the patriarch Jacob, his two wives Leah and Rachel and their handmaids Bilhah and Zilpah. Joseph, Jacob’s youngest son, was the offspring of Rachel, Jacob’s favorite wife. He flaunted his intelligence and prophetic abilities, and his father prized him above all of his other children. Great dislike and jealousy festered among Joseph’s brothers, who plotted to kidnap Joseph and murder him. Whether or not they wished to claim his portion of their father’s inheritance is not clear. Though he was cast into a pit full of snakes and scorpions, the young man survived, setting into motion the story of his journey to Egypt. Initially sold into slavery by unscrupulous captors passing the pit, Joseph was able to use his skill at dream interpretation to rise from servant of the palace guard captain Potiphar to become Pharaoh’s grand vizier, credited with saving Egypt from dire famine. The story continues on the Sabbath of Hanukkah when parashat Miketz is read. Joseph’s subsequent reunion with his father and brothers, detailed next week in parashat VaYiggash dramatically illustrates the workings of divine providence. I will post an illustration next Monday for that reading. Finally, if we posit a common thread tying the stories of Hanukkah and these parashiyot together, it might be the dual natures of blessings and adversity, where each occurrence is seeded with the other so that the outcome often manifests as a miracle, teaching us to appreciate the importance of both. Parashah Shelakh-Lekha, one of the best-known episodes in the Book of Numbers, concerns the twelve scouts, or spies, sent ahead of the Israelite camp to appraise the nature of the Promised Land. It is often compared to the Golden Calf incident of Exodus, in that both events were tests of the Israelites’ faith and trust in G-d, their leaders and themselves. When the expedition returned, ten of the men dramatically exaggerated what they had seen, in an attempt to discourage the Israelites from accepting their territorial inheritance. “We looked like grasshoppers to ourselves and so we must have looked to them.” In the left-hand illustration, the small hybrid grasshopper-man addresses the terror and trepidation the scouts disseminated. Perhaps, they calculated, their negative report would ensure positions of power for themselves among the people instead of encouraging the people to act with faith in G-d and in their own abilities? I have given this creature a tattoo in the shape of the Hebrew letter ‘mem’ whose numerical equivalent is forty because this incident doomed the Israelites to wander in the desert for forty years until a new generation arose that would be spiritually prepared to realize its divine inheritance. 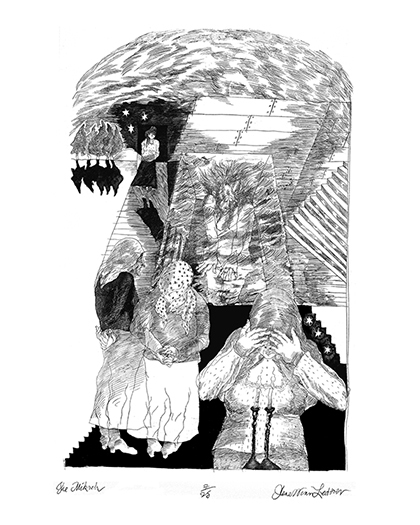 The symbols that comprise these illustrations each tell stories of their own that are too lengthy to include here. They can be found on page 169 in the AfterImages portion of my book, Between Heaven & Earth: An Illuminated Torah Commentary (Pomegranate, 2009) It can be purchased directly from the publisher, http://www.pomegranate.com/a166.html or from Amazon, amzn.to/gZSp5j where you will find several reviews.